Cheap-o option: Put a small squirt of dish detergent on a damp sponge. Sprinkle about 1 tsp table salt on sponge. Scrub the inside of the mug with that and rinse. 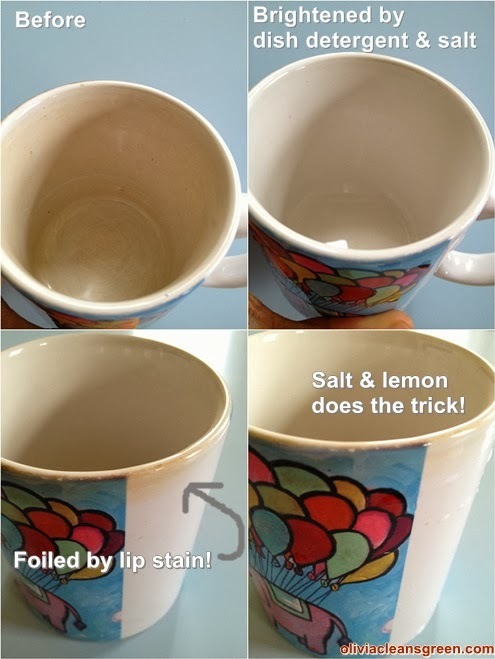 Most powerful option: Rub the inside of the mug with salt sprinkled on a halved lemon. Rinse. My favorite mug has an illustration by my dear friend artist Mark Ziemann (aka Z-man) on it. He's the same person who drew the illustration for the tattoo I got to celebrate my 24th birthday. I'll share that with you another day! I totally love the illustration. Thank you for giving me this nice idea. This is a great way to brighten my kiddos' day, especially now with the upcoming holidays. They are going to be thrilled. Thanks again!